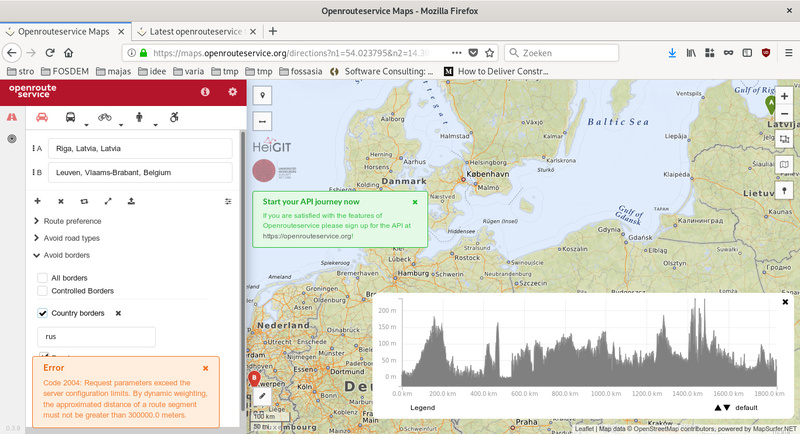 I’m trying to use the maps.openrouteservice.org web interface to map a route between a place in the Baltics and western Europe. This routes me through Kaliningrad by default. I don’t want that, since it means requesting a visa and customs checks. I checked for similar issues, but couldn’t immediately find any, so I hope you will appreciate me reporting this issue. Apologies if this is not the right place to mention this. In that case, please do point me in the right direction if there is any! Thank you very much for your work on open route service! currently we have to restrict the length of routes that use “dynamic weightings” (i.e. avoiding countries) to 300km due to processing requirements. We should be implementing a new algorithm within the next few weeks that makes it possible to use such restrictions on longer routes, so after the next release you should be able to request this route.